eG Innovations has received two awards for Best Private Cloud Coverage and Value Leadership from IT and data management research firm Enterprise Management Associates (EMA). EMA’s recently released Radar Report™ entitled: “Application Performance Management (APM) for Cloud Services” ranks eG Innovations as a cloud performance management leader based on its product architecture, deep integration, ease of administration, deployment and cost advantages. Specifically, eG Innovations has been recognized as the management software vendor with the “Best Private Cloud Coverage” for its superior private cloud management capabilities and very strong support for virtualized environments. eG Innovations also earned EMA’s “Value Leader” distinction among 11 management software vendors providing a multi-component APM solution. Patented Virtualization / Cloud-aware Correlation & Root Cause Diagnosis: Automatically correlates across metrics from different tiers to identify and fix issues before users call. eG Innovations’ correlation supports the dynamic inter-dependencies, such as VMware vMotions, that come with private clouds and provides deep visibility where traditional tools have limitations. Universal Agent Technology: Contributes to cost and administration efficiency and delivers maximum deployment flexibility. A single agent is capable of monitoring over 150 applications, 10 different operating systems, and 9 different virtualization platforms. “In-N-Out” Virtual Infrastructure Monitoring: Delivers both depth and breadth of insight into virtual application performance, a critical criterion for rapid and accurate diagnosis of performance problems. It is the only solution that provides both an outside view of a VM indicating the hypervisor’s physical resources used by a VM and an inside view of the VM indicating which application(s) and user(s) of the VM are causing the resource usage. 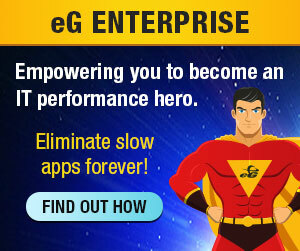 To read more about eG Innovations and download the summary of the “EMA Radar™ for Application Performance Management (APM) for Cloud Services: Q1 2012 (eG Innovations profile)”, visit https://www.eginnovations.com/cloud-monitoring.